I don’t care how technically sound you are with your strokes, you can’t execute every shot perfectly. Even the pros miss shots. You will miss a few shots or not hit them dead center on the face of the racquet. You can view missed shots as having two causes. Poor execution caused by improper footwork, for example, can lead to missing shots. Happens to the best of players. Mental errors or errors in strategy are another category of mistakes that cause missed shots. Most professional players understand that they can’t execute every shot spot on. But they can get upset when a missed shot is caused by a mental error such as trying to go for too much or tightening up on an important point. 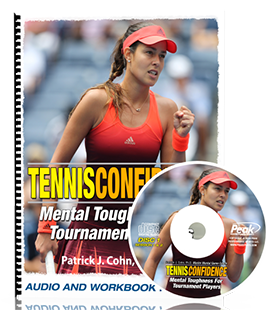 Many tennis players become frustrated when they don’t execute their shots perfectly. This may cause them to over analyze, lose confidence or avoid making mistakes. But, the top tennis players know that perfect execution isn’t always possible. They don’t lose their cool on the court. James Blake does not fret about missing shots due to miss-execution. He stays confident in his plan and his ability to execute shots. 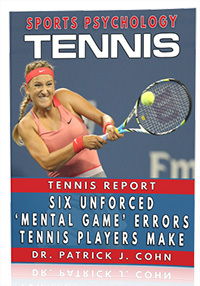 Most good players get frustrated when their strategy or mental game misfires and causes mistakes. They feel this part of the game is under their control. You have control over how much you go for on a point and being over-aggressive is a mental game error. Learn to accept mistakes if they results from execution errors. Don’t expect that you’ll make mistakes, but accept them when they happen. To improve your match performance, you can learn to manage your frustration better. This does not mean rushing on your service game or breaking a few racquets in the process. The key is to be more productive in managing your energy between points. You have 20 seconds between points to regroup and regain your composure before moving on to the next point. Use that time wisely. Use what works for you such as taking a deep breath, turning your back to the court or using positive self-talk.